No looking back, A new mother explains how she became a cloth convert! When I was pregnant with Squirmy, Hubby and I saw an episode of Dirty Jobs about a diaper service. The program pointed out some great advantages of cloth diapering. The one that stood out to Hubby and me was the environmental impact of disposable diapers. We were suddenly inspired to look into cloth diapering. Our journey was short... The price of local diaper services rivaled the cost of disposables. Family members who had used both cloth and disposable diapers warned us away from the "traumas" of diaper dunking, nasty diaper pails, rubber pants, and other unpleasant points. EVERYone told us the only way to go was with a diaper service. Seemed like a LOT of work for no financial savings...add to it, we hadn't decided about daycare vs me quitting my job. We turned our backs on cloth and went with the "only" option...disposables. I had friends online who were cloth diapering. I tipped my hat to them, but told myself I just couldn't do it. Then, when Squirmy was about a month old and the small stash we'd accrued was diminishing, we started wondering how we're going to afford diapers each week/month without having a second income. There was a nagging voice in my head reminding me that my friends had invested $200-$400 in cloth diapers and wouldn't have to spend a cent on another diaper...ever....not for this child or the next or.... I decided to take another gander at cloth. Surely all these women with infants the same age as my son couldn't be doing something as terrible as I was imagining. An afternoon of research later, I was armed with information. I was excited to tell Hubby ALL about this wonderful world of cloth I'd stumble upon. By the time he made it home from work I was rambling about AIO, OS, prefolds, doublers, pockets, prefolds, hybrids, and the clincher...the $2k we'd save just on Squirmy, let alone future children. I threw in some facts about the environment and health and who knows what else. It didn't really matter, I had him sold at saving $2k. But, I got my first batch in the mail and I was SUPER excited all over again! Then came the waiting while I washed them....over and over again. I didn't they'd ever be ready. Once they were, I was sold! I was (am) so in love!! Squirmy's perpetual red bum was almost instantly pasty white to match the rest his impossibly pale skin! They absorb wonderfully, almost never leak, and are so much better for the environment. I was starting to feel guilty as I used the last of our disposables for outings and for when I ran out of clean diapers before the laundry was done. We invested in some hybrid diapers for convenience sake (cloth liners for home and eco-friendly, disposable liners for theme parks and weekend trips). 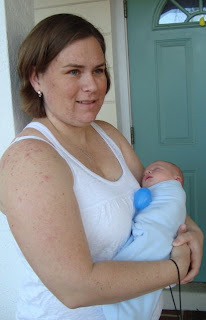 Guest Post by Tina, A first time mom learning the ropes and figuring out how to be a modern mommy! Visit her at http://makingofamodernmommy.blogspot.com! *Are you interested in getting published on the Knickernappies Blog? We'd love to have you. I love the nickname "Squirmy". Too cute.